If you will be travelling alone or in a small group and you don’t want to miss on the boat safaris, this is for you. It is how to do Kazinga channel boat cruise in a small group without meeting a high minimum cost or any hectic arrangement costs to the service providers. In the past, it was very complicated to do a boat cruise alone or in a small group whenever the minimum number required for the boat cruise was not reached. However, things have changed over time since the introduction of community boat cruise on Kazinga channel. With a group starting from two people, now you can take a community boat cruise and do that dream safari on these waters at the normal price. Take this chance with the several community boats that start at Katunguru. You can take the boat of choice by contacting your lodge or tour operator. These community boats charge a little fee compared to the fees of the standard boat cruise at Mweya. The minimum number of people required to book the full trip on this community boat are only two or three depending on the arrangement. This means if you’re alone, you will have to pay for the second or third person and you can go on the cruise alone. At the moment, the price for each community boat cruise is 25$ per person. In this case, if you’re two and above, then each person will pay the standard individual price. The boat cruise at Mweya is a different experience on its own, that you may be interested in taking. In case you want your group to join a scheduled boat trip at Mweya, it is important to book in advance to ensure that the boat has enough space for all of your group members. Every boat has a limited number of seats dictating the number of people they can take on each trip. If you want to just book and pay on arrival, you may find when the space available is not enough for all your team members. This safari is so easy to arrange. You don’t need to pay arrangement or booking costs. We arrange it for our gusts for free. Remember, the boat cruise on Kazinga channel can be quite competitive and scarce. For us to offer free arrangement services, you only have to let us know as soon as you decide. We will then look for availability and send you an invoice. We can also book it along with accommodation on our list of preferred lodges in all budget ranges, that adds you more affordable advantages to your trip. Please contact us now, to add this activity to your trip. Kazinga channel boat cruise still stands out as the best cruise you can ever do in Uganda. The channel is a rich habitat of all wildlife including birds, hippos, crocodiles, and birds. At all times of the day, you have a chance to view wildlife lined on the banks cooling off from the hot sun of queen Elizabeth national park. It is a 40 km natural cannel that connects lake George to Edward. Lake Edward is a cross boarder lake whose main part is located in the democratic republic of Congo. 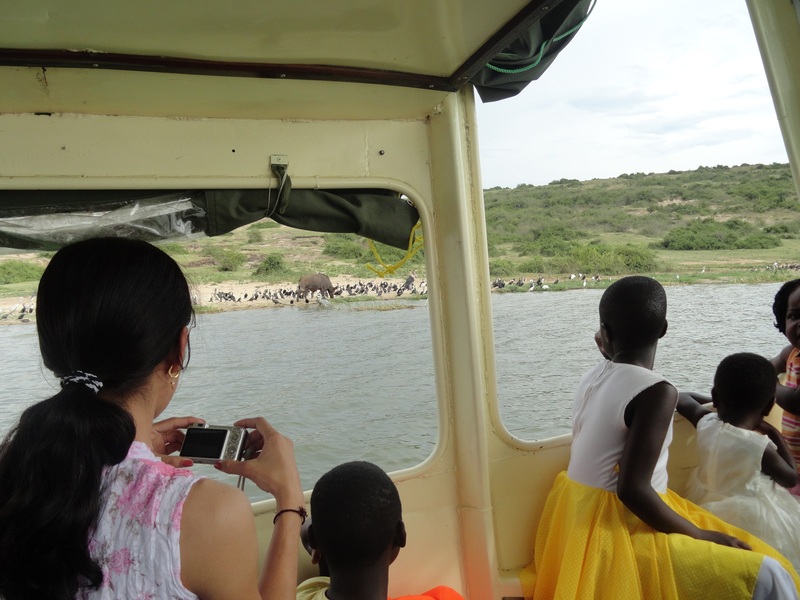 The standard boat cruise on Kazinga channel is arranged for groups of tourist being guided by experienced guides who give the interpretation to the background of wildlife during this water safari. To participate in this boat cruise experience, there are two options that guests can select from; the boat arranged by the park at Mweya visitor information center, starting from Mweya peninsular and the one arranged by the community at Katunguru, starting from katunguru trading center. Depending on the boat and location you choose, the standard boat cruise takes a capacity of guests ranging from 25-70 (with community boats being on the smaller side). Both are shared boats where each guest pays a small fee to join. Whether you need a private or shared boat ride with your group, we are able to arrange it with any of the two boat service providers. Please book now or contact us to give you more information regarding the boat cruise or other services such as transport or hotel booking.